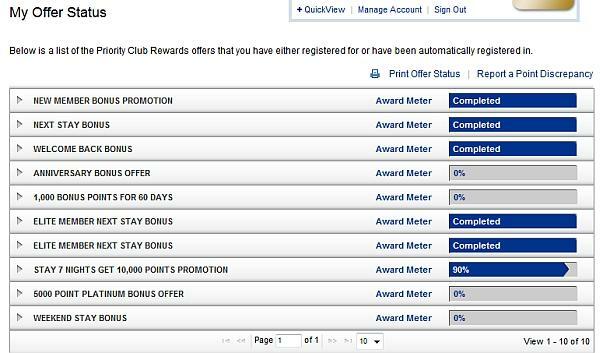 Priority Club has a 1000 bonus points for a stay in Canada. You can register for this promotion using a promotional code 7620 and your email address or Priority Club account number at priority.com/register. Please note that this promotion doesn’t show up on your “My Offer Status” tab on Priority Club’s website, although you do get confirmation email, but the bonus points did post to a stay that I had in Canada last week. I do not have expiry date for this promotion. Let me know if it doesn’t post for a stay that you had in Canada after successfully registering. This is a nice 1000 bonus points for a stay in Canada. It appears that this is one time bonus only, but I will update this post if it posts to my subsequent stay at IHG property here in Canada that I’ll have in couple of days. As always you should contact Priority Club if this doesn’t post for you stay in Canada unless you received an email/post card about this offer or were informed about it by a IHG property in Canada.